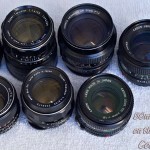 This first round of 50mm SLR camera lens testing will cover some of the fast f/1.4 glass. 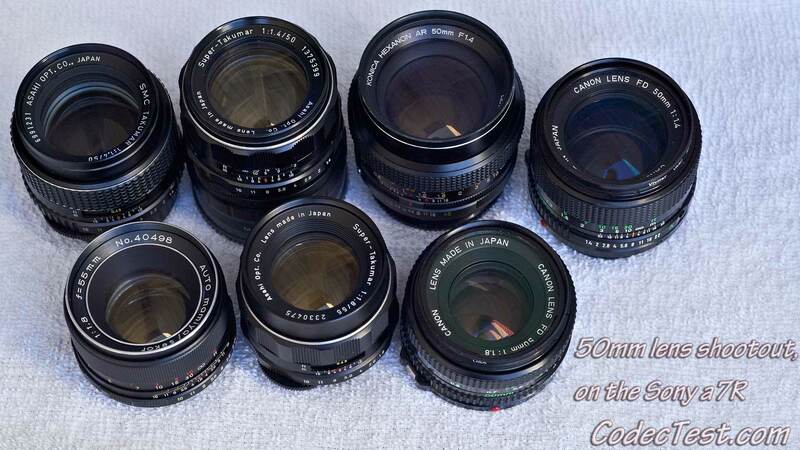 Four lenses total, all 50/1.4; Pentax Super Takumar, Canon FDn, Konica Hexanon AR, and SMC Pentax. 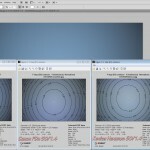 Here are the vignetting test results on the top three finishers, at f/1.4. They were all pretty close. The Pentax Super Takumar had a slightly slower shutter speed, but all RAW files were adjusted to be at roughly the same exposure, before processing. Only four of the lenses in the photo below have been tested so far, the slow glass will be covered later. 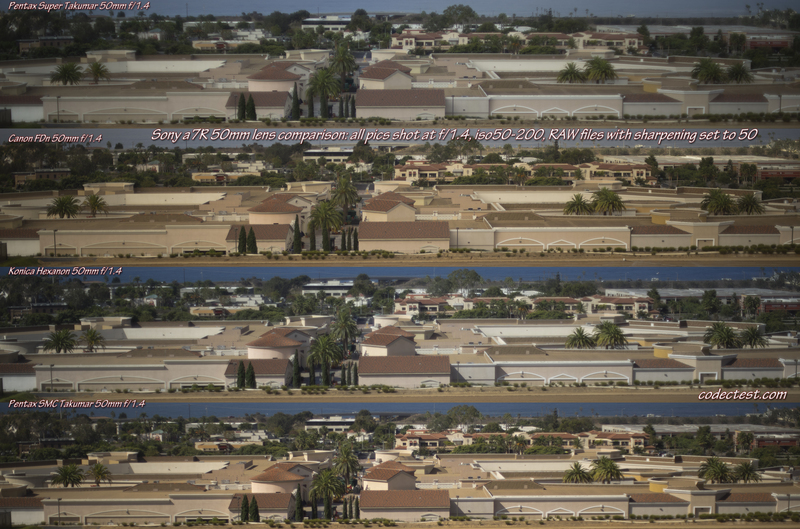 Ease of focus at long distances: The 50mm focal length, at this subject distance, is close enough to be using the second stage of Sony a7R EVF magnification. The “5610” street number on the back of the building is the focus point, as usual. All of these lenses worked fairly well for focusing, although the Super Takumar was probably better at focusing than the Canon FDn was. Sides of the images: *Wide open* f/1.4 makes picking the winner a bit easier. The SMC Takumar and the Konica Hexanon both go down hard here, they appear to have field curvature issues on the sides, so they are out for full frame use. It looks like it might be a possible lens design issue, so you may not find relief in different copies of the same design. 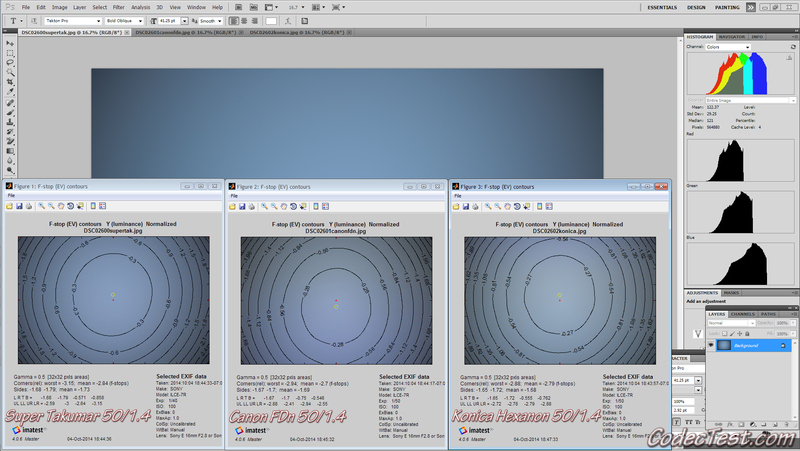 Of the two remaining lenses, the Canon FDn is the strongest of the four on the left side, but it is soft on the right side. Two points for the Super Takumar, and one point for the Canon FDn, on the hope that a different copy doesn’t have the same right-side defect. Center of the images: *wide open* The Super Takumar 50/1.4 beats the Canon FDn 50/1.4, one point; see the “5617” street number, on the front of the building, second street back from the camera, upper center of the image. The question here is whether or not the Canon lens is perfectly focused. *f/8* Things are a lot more competitive, you be the judge. Summary: The Super Takumar moves forward, but with reservations about whether or not the left side is as good as that model of lens actually gets. 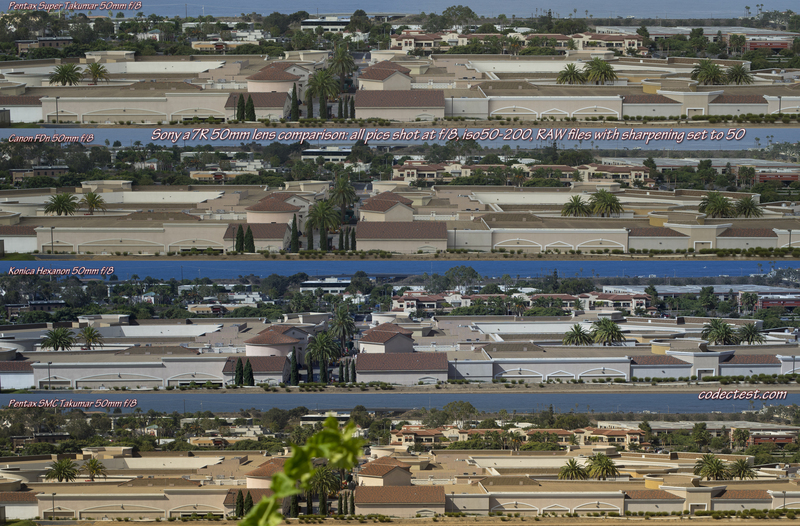 The slightly soft right side of the Canon lens makes one wonder what a perfect copy of it would look like. It has less veiling glow than the Super Tak does wide open, so the potential is there. This entry was posted on Sunday, October 5th, 2014 at 9:02 PM	and is filed under Camera Lenses. You can follow any responses to this entry through the RSS 2.0 feed. You can skip to the end and leave a response. Pinging is currently not allowed.